Duro-Last 50 mil was installed on the Galesburg Apartment Building in Galesburg, Illinois. 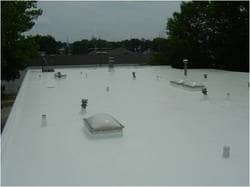 They chose Duro-Last to replace a leaking built-up roof. Riddell Roofing used prefabricated curved details and flashing around the many protrusions. Using pre-fabricated materials reduced installation time by 50%. A 3/8" slip insulation sheet was also installed to improve energy efficiency. The roof took two days to install and offered minimum distractions and interruptions to the tenants below.